Jack David (Pare) is a tough, outspoken cop who finds himself wrongly accused for the death of a fellow agent by the depraved and power hungry chief of Miami Customs, Martin Cullen (Ian Yule). Disgraced and dismissed, Jack swears revenge and goes to work for Roberto Largo (Ironside), a rich, evil Cuban crime boss, as bodyguard for his smoldering wife, Eva (Barbara Carrera). Jack knows Largo is connected to his old boss Cullen and is determined to learn the secret that will bring him down. 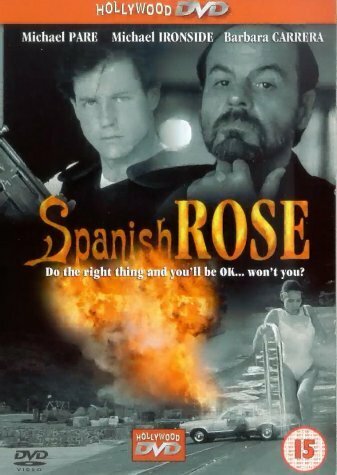 Trapped in a deadly game of cat and mouse, held captive by his passionate affair with Eva, Jack must figure out the significance of the mysterious Spanish Rose to survive. This movie just fails to engage. It's hard to pinpoint anything wrong with it. Barbara Carrera was oh so beautiful, and Michael Ironside was plenty villainous. Ian Yule's cornpone was a bit irritating. But you just can't find yourself caring about any of the characters or what happens to them. Grade: D- Being experienced enough to have watched many, and varied movies, I find this to be another example of Michael Pare's relaxed, natural ability to become his character. I must confess, this movie contains the sexiest love scene I've ever witnessed. As he lays back on the white sheets, surrounded by white curtains and breezes, and he tilts his head back, shutting his eyes tightly, drawing his breath in through his teeth in sheer pleasure, then saying "Oh god, oh god, oh god, oh god...", turning his face toward the camera... what can I say? Works for me. I also took a line from the movie as a personal identifier, rewriting it so as not to steal. It is when he picks her up in his apartment to take her to bed, saying: "Life is too short to say no!" No matter how the other actors carry off their roles, Pare' always gives each character he plays, his best.